Wildrose Party press release - Today, Wildrose Leader Brian Jean and PC Alberta Leader Jason Kenney announced their joint commitment to achieve unity. Both leaders shared their belief that they cannot and will not negotiate a memorandum of understanding for a potential unity agreement among themselves, but will form discussion teams with a mandate to work towards an agreement. Details on the discussion teams will be developed in the coming days and announced by the end of the week. There is also agreement for both Wildrose and PC caucuses to work towards greater cooperation in opposing the NDP government in the legislature. Tweedle Dum and Tweedle Dee. They have, in fact, mustered a gaggle of corporate lawyers, shills for big business, to determine how to do an end-run on Elections Alberta's disallowing of exactly this sort of corporate-merger type amalgamation of political parties. Like O'Leary, they choose to ignore the inconvenient language of democratic politics and instead speak about mergers/acquisitions/managers/CEOs/boards and the jurisprudence associated with the marketplace - an entirely different reality from that of parliamentary democracy. Democracy is not a business model exactly because it seeks to (or ought to seek to) affect prosperity for the greatest number of people rather than merely for a narrow band of shareholders. 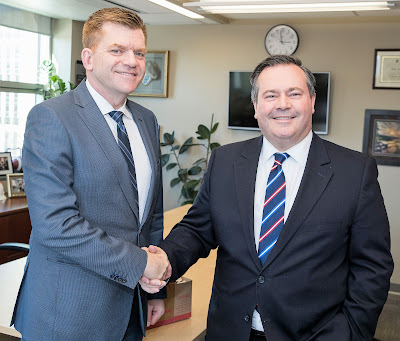 Men of honour would seek a coalition effort here without a jettisoning of ideals (mostly the rough surgical removal, yet again, of the progressive element of the Progressive Conservatives as Kenney hauls the dilapidated PC luggage over to the right), but this is patently only a naked grab for power. On the other hand, I quite look forward to all the caterwauling and gouging and spitting and fists-a-flyin' as these two behemoths of bankrupted Alberta politics attempt to occupy the same bus. Picture a bus-load of Eskie and Stamp fans on their way to the Grey Cup semi-finals with their jerseys on and their cheer-leaders going flat out and unlimited beer and gushes of testosterone coursing through their addled brains while a couple guys in suits up front squeak about some highfalutin plan to both cheer for the same team. I hope there's streaming video - should be quite the spectacle. And the Riders'll probably win anyway.